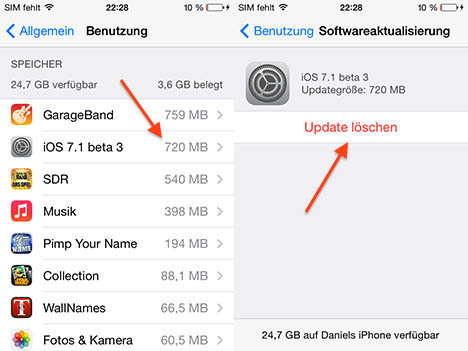 The third beta of iOS 7.1 includes a feature that allows users to delete the over-the-air installation files that are automatically installed whenever an iPhone is connected to AC power, according to German site Macerkopf.de [Google Translation]. Deletable installation files will allow users who do not wish to upgrade their devices to new versions of iOS to free up valuable space on their devices. Previously, updates downloaded over-the-air could not be removed, an issue that received attention in September after iOS 6 users were forced to install iOS 7 or lose 3.1 GB of storage space to the installation file. Users with iOS 7.1 beta 3 who have not installed the update will see it listed in the Settings menu, under General --> Usage, where it can be removed like any other app or file. The file can be deleted if it was downloaded over-the-air in the background or manually. While over-the-air files can be deleted as of iOS 7.1 beta 3, there is a possibility that this is a beta-only feature that will not make it into the final release of the software. Apple often adds and removes features during the course of beta testing, such as the dark keyboard that was available in iOS 7.1 beta 1 and removed in beta 2. First released to developers last week, iOS 7.1 beta 3 also includes a number of visual changes that give iOS 7 a revamped look and feel, including a redesigned Phone dialer, an improved keyboard, and darker colors for the Phone, Messages, and FaceTime apps. It is unclear when Apple plans to release iOS 7.1 to the general public, but a December report suggested the update could launch in March after a lengthy beta testing period. Update: As several commenters have pointed out, the new feature is actually part of the second beta, as it is the download for third beta that can be deleted without ever being installed. Need to make an update to iOS6 that allows us to delete the iOS7 "update"! This probably have to do with Apple getting sued by that iOS 6 user who lost space. He wanted his 3GB of space back and I can understand his PoV. Some devs need an iOS 6 devices to test their apps on, until they go iOS 7. They're forced to download iOS 7 without an option to turn it off. Sadly, it won't help the iOS 6 users. And I don't agree with that. No update file should be downloaded to a users device without them approving it. It appears this is fixing that. Too bad this feature is useless to the people it matters to most: users running iOS6. I don't really understand why someone would buy an iphone and then not want to have the latest software that leverages the hardware. For the 4 and 4s barely a maybe understanding, but for the 5, 5c, and 5s -- come on, you got the iphone, now update it and move on. I do hope they leave this in for developers. I totally get wanting to have phones at different iOS levels to test their apps. So you delete the file. Plug in your phone to AC power and it downloads it again? That's what I got from this article. Why not just have a switch to prevent OTA updates vs app updates? You see, Apple DOES listen! Albeit late. iOS 6 needed this. Too little, too late. That feature was needed for iOS 7.0 now its all over. I agree. I'm working in a remote place right now and all our communication is through satellite but we still have wifi. Whenever one of these updates comes out it almost shuts us down as everyones phone starts updating. I know not a common problem but it actually costs us money in overruns on our cap. There really should be an option to turn off automatic downloading of the update. Stop with the "everyone should stop complaining and use iOS7" comments already. It's not always about the new interface or the new icons. My brother has an iPhone 4 and iOS7 has rendered his iPhone almost unusable. It was running fine with iOS6. He's now thinking about switching to Android since Apple doesn't care about supporting older devices and even going to extreme like making them useless to force people to upgrade to new versions. Is that really what you people want? People so pissed at Apple that they will switch to something else instead? edit: and please don't reply with "don't update" or "read about it" or something similar. If Apple sends an update that basically kills your device WITH NO OPTION OF REVERTING to the previous version, it's a broken QA test and a broken design on Apple's part. One does not expect the maker of a device to render it useless. And if they do, then they just lost a customer. Yeah, but what do you want to bet that this will happen when iOS 8 is released, too? I'm all in. This won't happen again, only because iOS 7 already is the worst case. A complete GUI overhaul can't come too often. iOS 8 and 9 will look like iOS 7. So the problem won't come again, but it also won't go away. You can avoid normal problems like Mapgate by simply not opening the app. But you can't run away from the GUI. It's everywhere!